Here’s an article I wrote for WeUsed2bu Ministries. I just love this promise. I do not take it lightly. This Word sustains me. I realize that I DO NOT have to crumble under the pressures of this world because I have put my faith and trust in Him to help me, to strengthen me when I just can’t any more. I have come to humbly realize that I need to actively walk in this promise, even when I am not at my breaking point, because it is not by my own strength or power that I want to live any more, but by the Spirit and His power. I am weak without Him. Christians, our Savior has empowered us with the same power that raised Him from the dead: the power of the Holy Spirit. It is through the Holy Spirit that we can daily learn to live as overcomers in this world. (Romans 8:11) When life’s troubles or obstacles come our way, we don’t have to tremble with fear or anxiety. We don’t have to freak out and wonder what we are going to do. Instead, we can trust in His promises, run to His Word for wisdom and direction, and rely on Christ’s strength to face all things that will come against us. I love how Philippians 4:13 reads out of the Amplified. Read it out loud. We can be more than conquerors through Christ Jesus Who strengthens us! Let’s learn to live and walk out Philippians 4:13 in our daily lives. You said, "There have been times where I have felt like I am just going to break under life’s pressures, that if one more thing happened, I was just going to lose it!" I have to admit, that is exactly how I'm feeling at the moment… But God knows, and I am trusting Him for something GOOD to happen, or that He will give me the strength and grace to keep going no matter what comes my way. Thanks Stephanie & Lloyd for your comments. When I get a chance I will stop by your site.Stephanie, God is always faithful to provide everything we need whether it is a way of escape or the strength and courage to press forward through the trial. 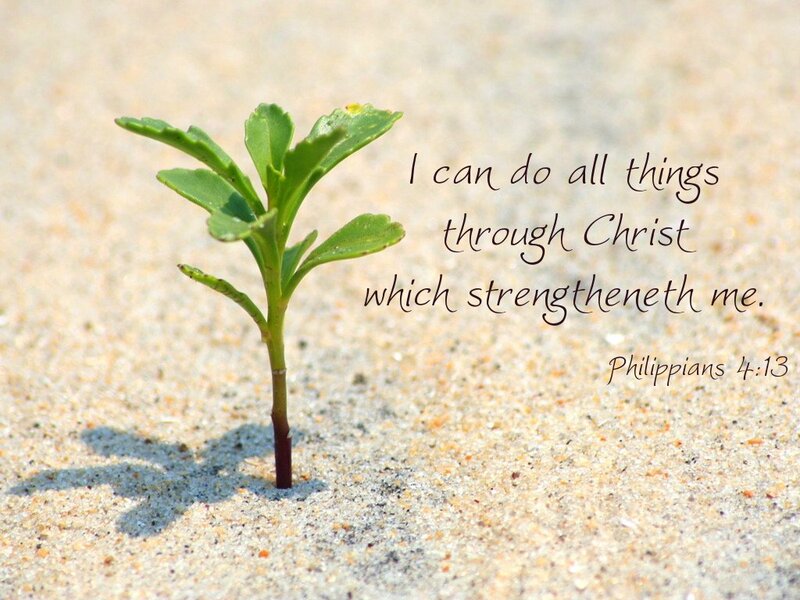 We can do all things through Christ Jesus who strengthens us and we will do it by not by our own strength or might but by the power of the Holy Spirit. Don't get tired in doing good sister, soon you will reap your harvest if you do not get tired and give up.